The placing or installation of solar panels on your home (roof top) is very important aspect of harvesting solar energy for your household needs. It requires much more care similar to selection of solar panels itself. Project Sunroof puts Google's expansive data in mapping and computing resources to use, helping calculate the best solar plan for you. 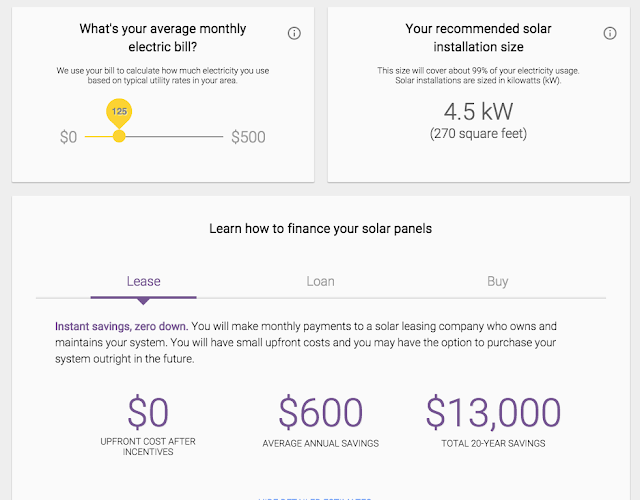 Google now lets you see if your house is a good candidate for installing solar panels. Project Sunroof, a 20 percent project by Google engineering lead Carl Elkin, shows you how much solar power your roof could generate using Google Maps and the data it has about the surroundings of your home. This means it can take into account local weather, your roof’s orientation and how much shade falls on it from nearby trees and buildings. Using the new Project Sunroof website you can take a look at your house and see if it's a good candidate for solar panel installation. The website asks you to enter your address in Google Maps, then uses the location data, Street View, and satellite imagery to calculate the shape of your roof, how much sun your roof gets, and factors in shade from trees and other buildings. It even connects you to solar panel installers in the area, just in case you're so pumped by the results you can't wait to take that next step. The US tech giant said its "Project Sunroof" online tool is now available in the area around San Francisco and Fresno in California and around Boston, Massachusetts. The new tool "uses high-resolution aerial mapping (the same used by Google Earth) to help you calculate your roof's solar energy potential, without having to climb up any ladders," Google engineer Carl Elkin said in a blog post. The website "figures out how much sunlight hits your rooftop throughout the year, taking into account factors like roof orientation, shade from trees and nearby buildings, and local weather patterns" and then "combines all this information to estimate the amount you could potentially save with solar panels," Elkin said. It can also connect homeowners with local solar providers. Elkin said the effort aims to overcome consumer concerns and encourage the use of green energy that reduces carbon emissions. "The cost of solar power is at a record low," he said. "A typical solar home can save hundreds or even thousands of dollars per year on their electricity bill.